The Food Allergy Queen: Regular people food! One of the keys to surviving food allergies is to try to select cuisines that are naturally free of your allergens. I eat a lot of Mexican, Thai and Indian food because it's easy to avoid wheat and dairy, for example. So it's particularly thrilling to order "off the rack" at a restaurant. It happened three times in one week! Unexpected presents for the FAQ. The first is just a "self serve" pile of Middle Eastern goodies (where you pay by weight) from The Falafel King chain (this one located at the 3rd Street Promenade). It had a bit too much garlic since I'm allergic to garlic, but overall was very hospitable to the FAQ. And delicious! Falafel, baba ghanoush, cucumber salad, pickled turnips and some lamb schwarma. Mmmmmm. The second meal shown is from Fritto Misto in Santa Monica. While they have really great traditional pasta and salad dishes, they are also very friendly to alternative diets. Offering wheat-free as well as "veggie" pasta choices, you can customize your dish to be completely allergen free. My choice here is basically julienned steamed veggies serving as pasta (zucchini, cabbage, broccoli) with turkey sausage sauced with a cilantro pesto. 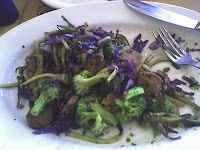 This looks like just a pile of veggies, but it tasted like pasta, dangit! 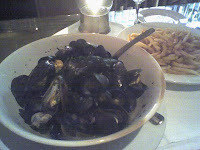 Lastly I'm showing you a big bowl of Moules Frites (mussels and fries) served up at my favorite hangout, Lilly's French cafe. Steamed in white wine and shallots, it was light, tender, delicious and came with a HUGE portion of my favorite fries which I dunked in mayo. I'm a happy girl. It was so nice to just order regular people food for once! Food is meant to be enjoyed, and it certainly was.